On Saturday 15th July, Shane and I arrived at Goodwood Motor Circuit for the launch of the 2017 Mongol Rally. After parking Martha amongst her friends and putting up our tent, we were joined by some friends of our own– Rhiannon, Hannah and Catherine – who had travelled far and wide to see us off. We took them to see a few of the other cars, gave them one last chance to write on Martha and then had a drink and something to eat before they headed back and we started to mingle with some of our fellow teams. 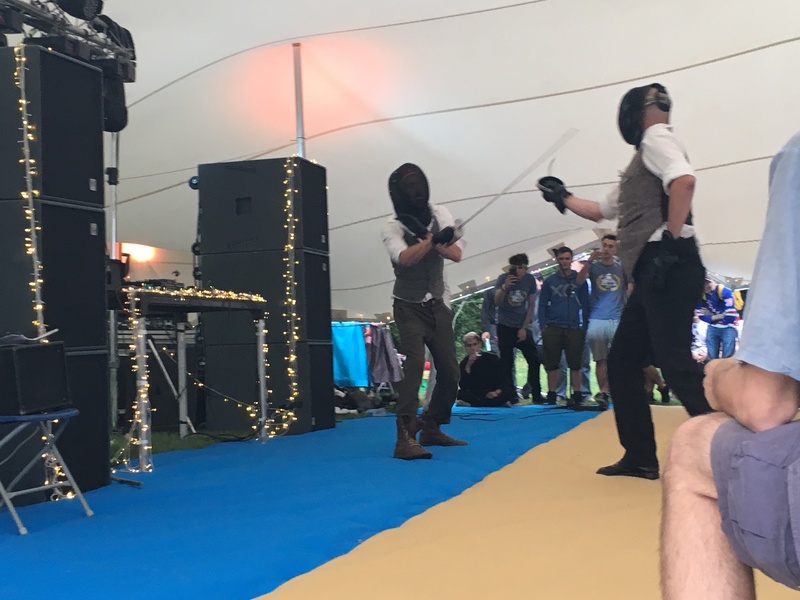 The Adventurists put on a whole evening of organised fun – from Mongolian wrestling to sword fighting to a late night dance party, there was plenty to see and do, and no shortage of other people who were just as crazy as us and planning to drive their cars all the way to Mongolia. We even met a couple of people planning to drive the whole way to Mongolia on a motorbike. To me, this seemed mad. They would have no spacious back seat to store ridiculous amounts of super noodles (or have a nap in), no protection from the elements and no one else to take over the driving when they’ve just had enough. They are very, very brave. Or very, very stupid. 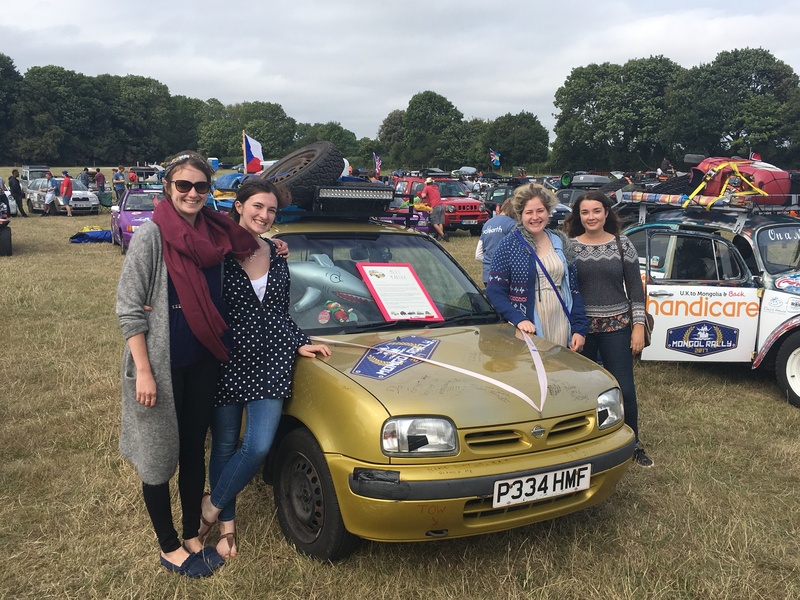 It makes doing the Mongol Rally in a Micra look like a trip to a theme park. 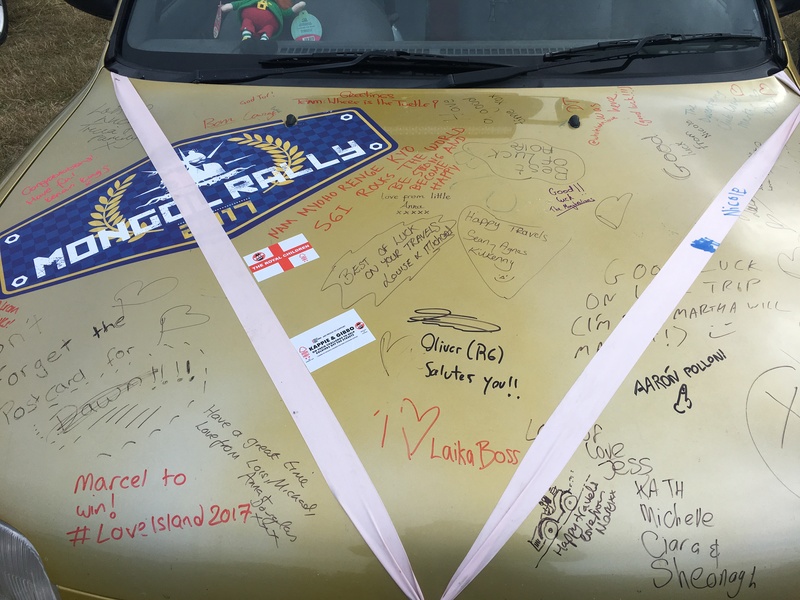 Some messages from our fellow Mongol Rally teams! On Sunday morning, Shane and I woke up in our little tent (our home for the next eight weeks), and had our first argument, as Shane insisted we get up and pack the tent and sleeping bags up at 7am, even though there was nothing to do and nowhere to go for at least another hour or two. Sure enough, at 7.15, we were sitting in the car with nothing to do and nowhere to go, and I was wishing I’d had an extra snooze. Eventually, it was time to get moving from the campsite to the race track. We had time to stop for a quick picture with the other Irish teams taking part in the rally, which also gave us a good opportunity to test out the roof rack (it held Shane and I and our belongings without complaint), and then it was time for a whole group photo and the Mongol rally prizes. 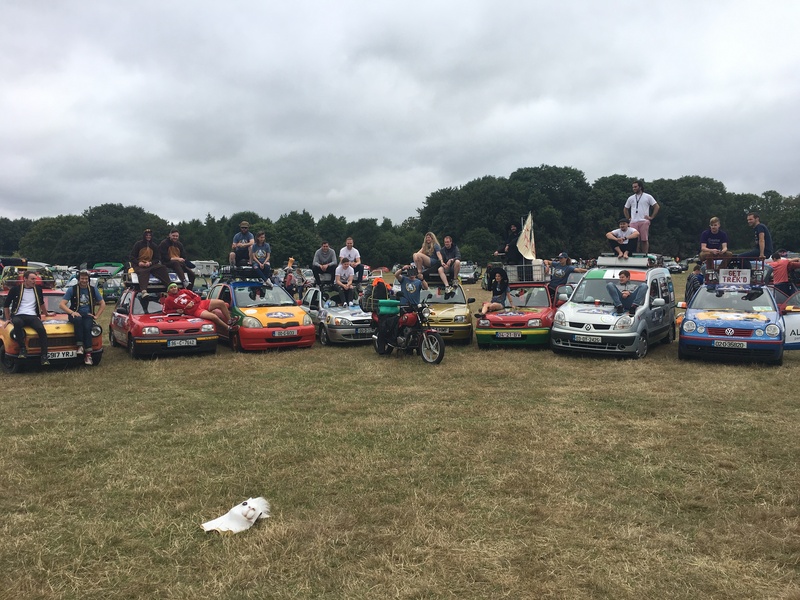 All the Irish Mongol Rally teams! 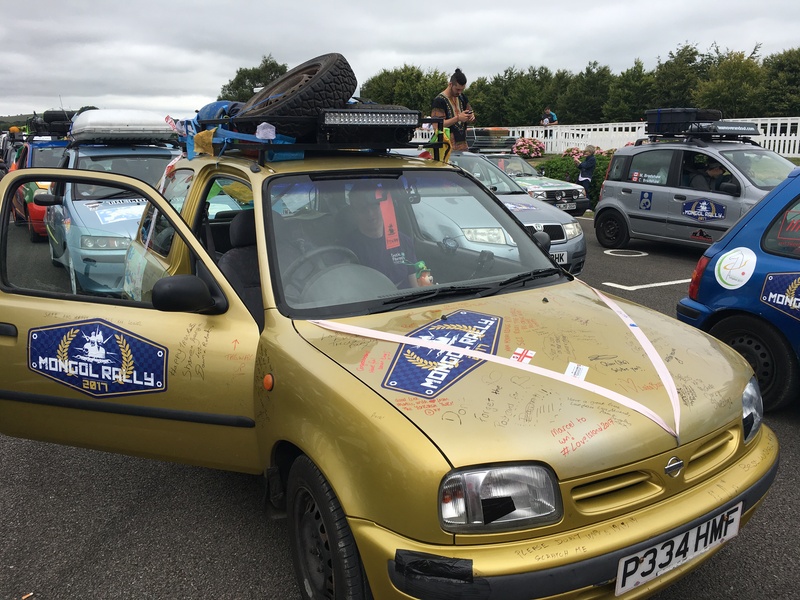 “Spirit of the rally”, given to the team who most fully embraced the spirit of the Mongol Rally by taking the smallest, most rubbish car, which was most likely to break down. This went to two teams who were driving Morris Minors (one 1964 and one 1970). They had already broken down four times just trying to reach Goodwood. “Best pimped car”, given to the team who made their car look the most ridiculous, or most interesting. This went to a team who had covered their car entirely in fur. The third prize was more of a forefeit than a prize. One team had brought a 1.6 liter vehicle (which is very much against the rules – the car is meant to be 1 liter or less). As punishment, they were publicly shamed and given a heavy exercise bike which they now have to put on their roof and bring all the way to Mongolia. Next, we lined up row by row and completed a lap of the race track , and then we were on our way! 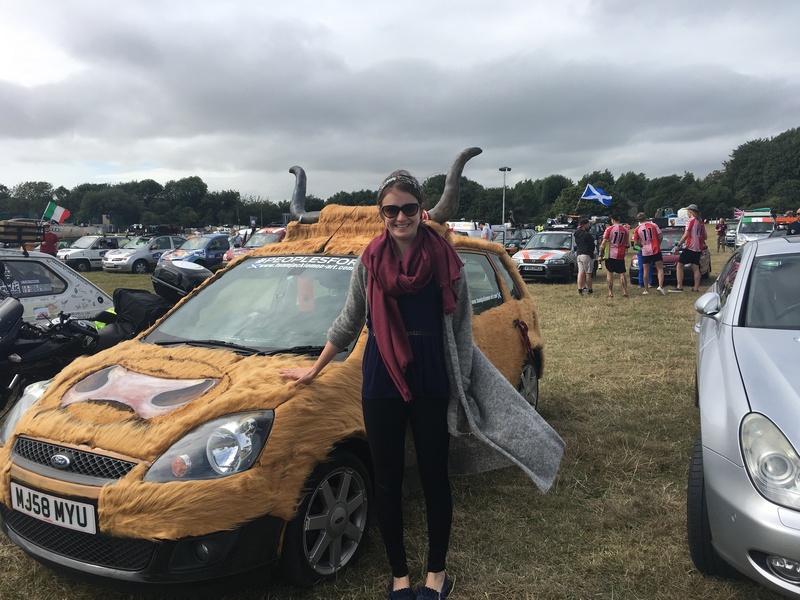 The Mongol Rally has officially started! Our first stop was Dover. Our only problem was that there was a major accident on the M25, which we tried to avoid by going cross-country around the South Downs. The scenery was beautiful, but it took us an hour longer than planned and we got stuck behind numerous slow moving vehicles, including a steam train. We didn’t get to Dover until 3.30, and had to wait until 4.40 for the next ferry. Our plan to do another three hours of driving after reaching Calais was looking increasingly ambitious, and our Mongol Rally whatsapp group was pinging with news from other teams who had reached Amsterdam, Brugges and even Germany, while we were still yet to leave the UK. But, better late than never, we made it on to the ferry and found plenty of other teams going at much the same rate. 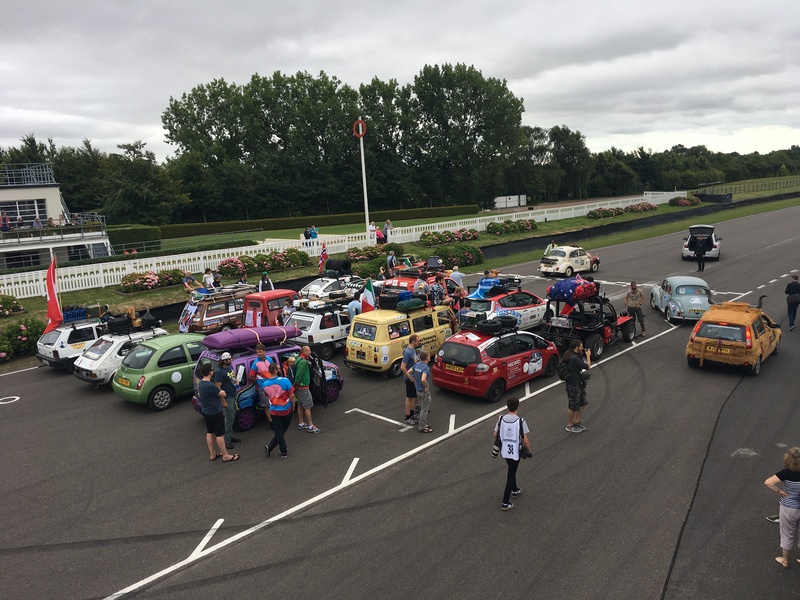 We also heard that there had been some teams who were not doing so well, and had broken down between Goodwood and Dover. 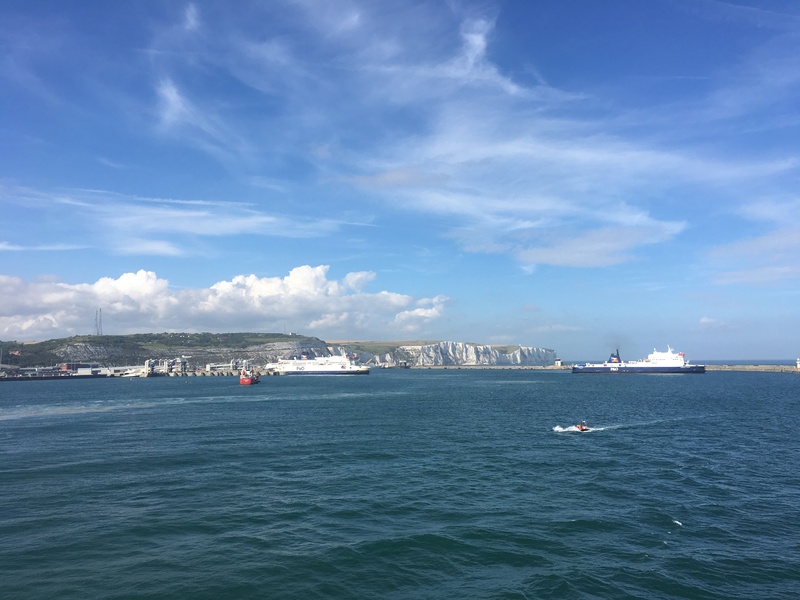 As we sail away from the cliffs of Dover, this will be our last blog from the U.K. Our plan is to spend the next two days meandering away across France, Belgium and Germany before our next big stop: Prague.